Buy at least 2 GT Tyres in 17” and above and receive an ASDA Gift Card! If you buy two or more GT tyres in 17” and above from Asda Tyres in April you can claim an ASDA Gift Card worth up to £20. The ASDA Gift Card can be spent in any of the 630 ASDA stores across the UK. To find your nearest store please visit: https://storelocator.asda.com. You can also spend your Gift Cards online at George.com. Please note that the ASDA Gift Card cannot be used at 3rd party concessions, including petrol stations. By taking part in this promotion all participants will be deemed to have accepted and be bound by these terms and conditions. The promotion is open to all UK customers excluding residents of Northern and Republic of Ireland. Applicants must be aged 18 or over and the promotion excludes employees and their immediate families of Colewood Automotive, Giti Tire (UK) Ltd , and any company affiliated with the organisation, their agents or any other persons professionally connected with the draw. To apply for the vouchers complete the online form linked to the promotional web page on asdatyres.co.uk (https://www.asdatyres.co.uk/gt-radial-asda-voucher). Entries or claims not received, incomplete, Illegible or delayed will not be accepted. The opening date and time for receipt of entries is midnight on the 31st March 2019 and the closing date and time for receipt of entries is 23:59 on 30th April 2019. Maximum one application per person per tyre order. Anyone trying to circumvent this condition by using alternative details will be disqualified. No bulk, consumer group or third party entries will be accepted. Free Gift: To qualify for the gift card, you must have purchased a minimum of two GT tyres in 17” and above from ASDA Tyres. 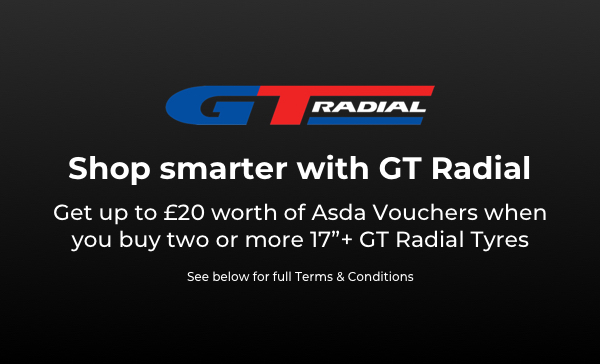 The promotional vouchers are ASDA Gift Cards dependent on which size of GT tyres are bought as shown in the Voucher Value table above. The vouchers are non-transferable, non-refundable and cannot be exchanged for any cash alternatives in whole or in part. The decisions of the Promoter are final in relation to the promotion. The vouchers will be dispatched by the Promoter no later than 4 weeks after receipt of a valid application together with proof of purchase. In the event of unforeseen circumstances, the promoter reserves the right to replace entire prizes or prize components with prizes of equal or greater value. Recipients of the vouchers be required to participate in and give their consent to related publicity including their names and photographs being used for promotional purposes and/or reasonable requests to take part in the Promoters’ publicity. Proof of sending a voucher application shall not constitute proof of receipt. The promoter shall not be liable for any loss or damage whatsoever, except for death or personal injury, arising out of the administration of prize draws, or out of the winner’s or any third parties enjoyment of the prizes. Vouchers are awarded at the promoter's discretion and no prizes will be awarded as a result of improper actions by or on behalf of any entrant. Promoter: Colewood Automotive, Colewood House, Building 1, Kingfisher Court, Bowesfield, Stockton on Tees, North Yorkshire, TS18 3EX. Data Controller: ASDA Stores LTD, Great Wilson Street, Southbank, Leeds, West Yorkshire. LS11 5AD. Terms and conditions apply. 18+, UK only excluding Northern and Republic of Ireland. Prize draw opens midnight on 1st April 2019 and closes at 23.59 on 30th April 2019. Free Gift:- ASDA Gift Card. Maximum one entry per person per order. For full terms and conditions, https://www.asdatyres.co.uk/gt-radial-asda-voucher. Promoter: Colewood Automotive, Colewood House, Building 1, Kingfisher Court, Bowesfield, Stockton on Tees, North Yorkshire, TS18 3EX.